After devastating fires, floods and other disasters rebuilds that take place especially in areas that may be susceptible to future damage need improved building codes and construction standards that better protect properties against future disasters. I’ve done much research on the best way to move forward with rebuilds after recent disasters. I’ve continued to work with some industry experts that have added to my education on the whole subject improving rebuilds being completed with fire resistant wood framing and exteriors that are waterproof and Class A fire resistant. These are the two areas that we need to focus and concentrate on to protect structures and their contents. The first line of defense is the exterior surfaces that must be fire resistant and weather/waterproof. Proactive measures need to be taken to protect and defend your properties against fire and floods by rebuilding with new and improved technologies and defending existing properties with those same updated technologies. 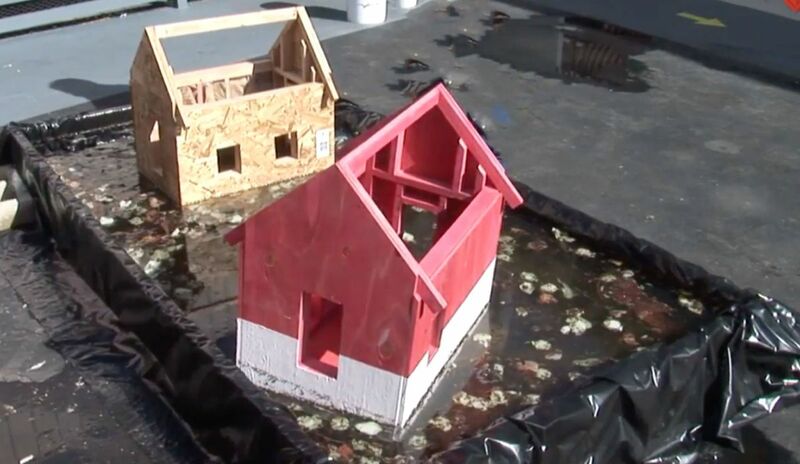 New homes and buildings along with existing structures must be made as waterproof as a boat. That means turning surfaces that are normally porous and susceptible to absorbing moisture especially during heavy weather events and rising waters through flooding into a waterproof defense. Most new buildings are designed to stop water penetration and moisture absorption with wall fabrics. These sheets come on rolls, are attached with staples and not fully adhered to the surface. They are designed to protect against falling rain and not rising water. Seeing how these wall fabrics are not fluid applied and fully adhered to the surface they are meant to protect they allow rising water from flooding to easily penetrate them. They also allow other things to simply get underneath and through them, such as insects and rodents. When new construction starts especially for rebuilds all the building lumber needs to be treated with a material that turns it fire resistant and in addition all the exterior surfaces need to be coated with a product that creates a waterproof, seamless membrane at the very least up to the lowest window sills. The best product I have found that can turn combustible wood framing fire resistant is from M-Fire Mighty Fire Breaker https://www.mightyfirebreaker.com/index.html. They have a GreenGuard, registered flame resistant product that is the best wild fire defense for all wood framed buildings. Hurricanes, Typhoons, Nor'easter’s - Oh My! © Copyright 2019 Encasement Guy - Encasement Coatings Consultant All Rights Reserved.